Here’s a big TechCrunch global shout-out to all countries interested in showcasing their best and brightest technology startups. Come to Disrupt San Francisco 2018 on Sept. 5-7 at the Moscone Center West and join more than 1,200 early-stage startups in Startup Alley, the very heart of every Disrupt event. A country pavilion waits just for you. We’re looking for delegations of international startup groups, government innovation centers, incubators and accelerators to claim a country pavilion in Startup Alley. Are you ready to step on a world stage, show off your emerging companies and be recognized as a world leader in tech innovation? Startup Alley is prime real estate, where hundreds of founders from everywhere in the world — and investors looking to fund them — gather to meet, connect and network. And maybe even produce a unicorn or two. If you want to exhibit in Startup Alley as part of a country pavilion, your delegation startups must meet one low bar: they have to qualify as Pre-Series A companies. If they do, we want to hear from you, so shoot our Startup Alley manager an email at priya@techcrunch.com. Tell us about your delegation and where you’re from, and we’ll provide more information about the application process. Countries that have participated in previous TechCrunch events include Argentina, Austria, Belgium, Brazil, the Caribbean, Catalonia, the Czech Republic, Germany, Hungary, Hong Kong, Korea, Japan, Lithuania, Taiwan, Ukraine and Uruguay. We believe that innovation and great ideas know no geographical boundaries, and we strive to increase the diversity within our country pavilions at every Disrupt. We’re so serious about inviting the world that we’re putting our money where our mouth is. Sign on for a country pavilion and you’ll receive a discount off each Startup Alley company’s exhibitor package, and you’ll get organizer passes to the event. 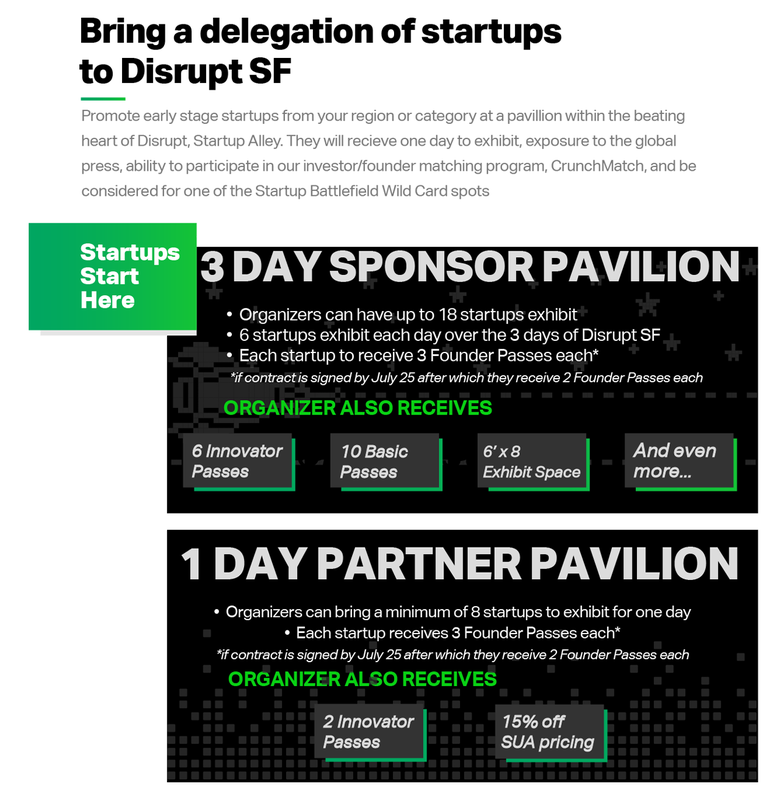 Plus, if you book your pavilion before July 25, your startups will receive one additional Founder ticket to attend Disrupt SF. You’ll find ticket pricing info here. And in case you haven’t heard, Disrupt SF 2018 is going to be the only Disrupt event in North America this year. Not only that, by moving to a new venue, we’re tripling our floor space, and we plan to host more than 10,000 attendees. It’s our biggest Disrupt ever. Don’t forget about all the phenomenal programming that Disrupt offers. We’ve expanded to four distinct stages — including the Main Stage featuring interviews with tech titans and icons. You can expect programming that spans 12 tech category tracks: Artificial Intelligence, Augmented/Virtual Reality, Blockchain, Biotech, Fintech, Healthtech, Investor Topics, Justice/Diversity, Mobility, Privacy/Security, Robotics and Space (as in “outer”). Then there’s the illustrious StartUp Battlefield, where competitors vie for a grand prize of non-equity cash, investor love and serious bragging rights, a virtual Hackathon (more details on that coming soon), Q & A Sessions that let you dive deep on crucial tech, hands-on workshops and after parties. If you’re a founder or an investor, you need to know about our CrunchMatch platform. It’s a quick, easy and efficient way to cut through the noise and connect with and meet the people looking for funding and the folks looking to provide it. Disrupt San Francisco 2018 takes place on Sept. 5-7 at the Moscone Center West. Don’t miss the chance to showcase the best tech companies in your country. Email us about reserving your country pavilion today.